After breakfast depart to Masai Mara, drive via Narok (the major Masai Administrative center) to one of the stellar events of our safari‐ The Masai Mara Game Reserve, Kenya's most precious wildlife sanctuary. This is big game country and long famed as one of Africa's greatest concentrations of game. Plains games are found here in staggering numbers, which in turn supports a tremendous predator population. During your afternoon game drive, you will have opportunities to see herds of Impala, Wildebeests, Giraffe, Elephant, Topi, Wild Buffalo, Warthog, Ostrich, as well as Lion, Cheetah, Hyena, and possibly the elusive Leopard. Transfer to Hotel, Overnight at Mara. Your schedule today includes pre‐breakfast and late afternoon game drives. Traveling across the savannah, you’ll rendezvous with the Mara residents‐ herds of Buffalo wildebeest, hartebeest, impala, and gazelle. The Masai Mara is the northern‐most extremity of the great Serengeti ecosystem. Here, black Rhino browse among dense thorn bushes and herds of giraffe and elephant roam the woodlands. Large numbers of hippos gather to feed and swim in the Mara River. Boasting Kenya'’ largest predator population, the reserve is renowned of lion prides up to 20 strong. Nestled under canvas, tonight you’ll dream of all the wonders of Africa, Overnight at Mara. Distance from Masai Mara to Lake Nakuru is 240Kms 5 to 6 hrs approx. After breakfast, visit Giraffe Centre. Later drive to Lake Nakuru and arrive in time for lunch. 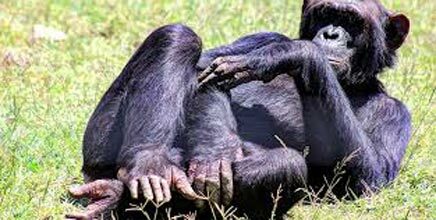 In the afternoon enjoy game drive in Lake Nakuru National Park. 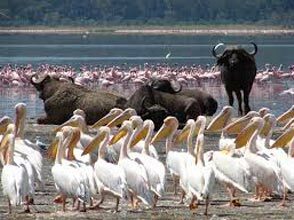 Lake Nakuru National Park regarded by avid birders' as the greatest World ornithological spectacle on the Earth. The Park is famous for its pink flamingoes lining on the lake shore. A spectacular afternoon game run is planned. The park is a Sanctuary to the Black Rhino, White Rhino and the Rothschild Giraffe. 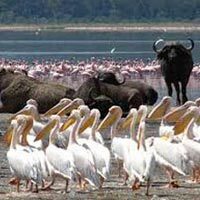 Bird life include common species like the lesser and Greater Flamingoes, African fish Eagle, Tawny Eagle, Green Wood Hoopoes, Cliff Chat, Great White and Pink Backed Pelicans plus other intra‐ African Migrants, Dinner and overnight at Lake Nakuru National Park. (Distance from Lake Nakuru to Nairobi is 170kms ‐ 3 to 4 hours) After breakfast departs for Nairobi, and take your flight back Home.